“The name ‘Seraphim’ does not come from charity only, but from the excess of charity, expressed by the word ardor or fire. Hence Dionysius (Coel. Hier. vii) expounds the name ‘Seraphim’ according to the properties of fire, containing an excess of heat. Now in fire we may consider three things. “First, the movement which is upwards and continuous. This signifies that they are borne inflexibly towards God. “Secondly, the active force which is ‘heat,’ which is not found in fire simply, but exists with a certain sharpness, as being of most penetrating action, and reaching even to the smallest things, and as it were, with superabundant fervor; whereby is signified the action of these angels, exercised powerfully upon those who are subject to them, rousing them to a like fervor, and cleansing them wholly by their heat. Where are Seraphim talked about in the Bible? In the New Testament, Revelation 4:6-8, “creatures” are singing the Trisagion song. Possibly this could also be Seraphim. And before the throne there was a sea of glass, and in the center and around the throne, four living creatures full of eyes in front and behind. The first creature was like a lion, and the second creature like a calf, and the third creature had a face like that of a man, and the fourth creature was like a flying eagle. Each of the four living creatures had six wings and were full of eyes inside and out. Without stopping day or night they were saying, Holy, holy, holy is the Lord God Almighty, who was, who is, and who is coming very soon. 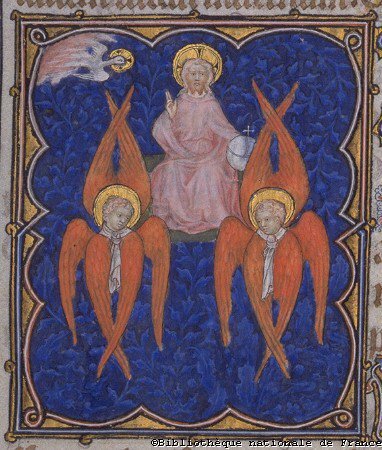 God Surrounded by Seraphim. From the Petites Heures de Jean de Berry, a 14th-century illuminated manuscript. 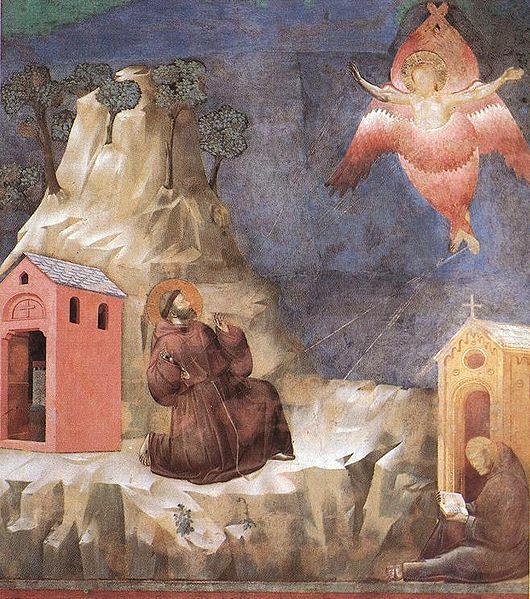 Giotto di Bondone (1267-1337), Basilique Assise, Legend of St Francis, Stigmatization of St Francis. Saint Seraphim of Sarov (30 July 1754 – 14 January 1833), born Prokhor Moshnin, is one of the most renowned Russian monks and mystics in the Orthodox Church. He is generally considered the greatest of the 19th century startsy (elders) and, arguably, the first. He is remembered for extending the monastic teachings of contemplation, theoria and self-denial to the layperson, and taught that the purpose of the Christian life was to acquire the Holy Spirit. 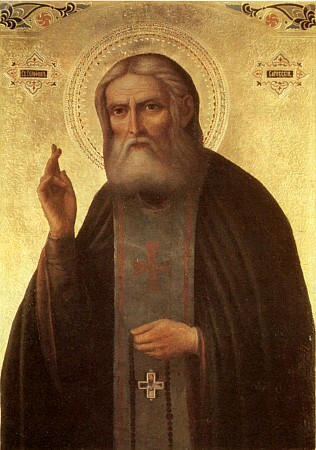 To read more on St. Seraphim: Seraphim of Sarov – Wikipedia, the free encyclopedia.